Azure RemoteApp is a service from Microsoft which brings scale and agility to your business applications. This service provides global access to your corporate applications from anywhere and at any time. On 11th of December RemoteApp became general available so it is time to give an overview and some hands-on experience on this new azure service. RemoteApp is designed based on the already existing service Remote Desktop Services (RDS) which you can add to a Windows Server 2012 installation. RemoteApp still requires some of the RDS components to actually run and to provide access to Windows applications in the cloud. I will come back on this details later on in this blog. Scalability and cost-effectiveness are the main advances of RemoteApp as a part of the Azure Cloud Platform. It is scalable because you can scale up very quickly to provide access to a new group of users without adding extra infrastructure servers (horizontal scaling). This scalability also brings cost-effectiveness because you can dynamically scale up and down based on a Pay-per-Use model. In this Pay-per-Use model, the service is offered in two tiers and the usage is billed per user. The exact details can found here. These different tiers are known as the basic and standard tier. Where the basic tier is intended for lighter, task-worker uses cases such as a single productivity application or a web browser, the standard tier is more suited for the productivity applications like Office or client-server applications. In this case the starting price for the basic tier is € 7,447 and the usage is capped on € 13 per user/month. The standard tier‘s starting price is € 11,18 and is capped on € 18 per user/month. This starting price includes 40 hours of use per user/month. When a user exceeds these 40 hours an hourly overage rate is triggered which provides another 40-45 hours of usage on a Pay-per-Use model. When the user also exceeds the use of these hours, the financial cap is reached but the users are still able to make use of the service. Bottom line you are only billed for the cap price per user/month on different tiers. When I had a first look on this prices, I considered it to be very expensive. But you have to take into account there is no need for RDS servers (maintenance) or RDS licenses (CALs). You now simply pay for the actual use, scale up or down when needed and you can access the service from any device. This all together makes it worth an actual consideration to bring RemoteApp into production. 50 GB storage per user. The cloud and hybrid deployment does require an explanation. The Cloud deployment model is used to publish some standard Microsoft applications for example: Office 2013 or your own custom image. This deployment does not have a integration with the local network. Optionally you can use Azure AD Sync to synchronise your local identities to Azure AD so your users can make use of their local credentials to login to their RemoteApp applications. You can also use Microsoft ID’s to provide access to the RemoteApp collection. The Hybrid deployment model is used to publish corporate apps. This means this deployment does have a direct integration with your local network using a VPN. In this way you can publish corporate apps and access resources which exists in your local network. 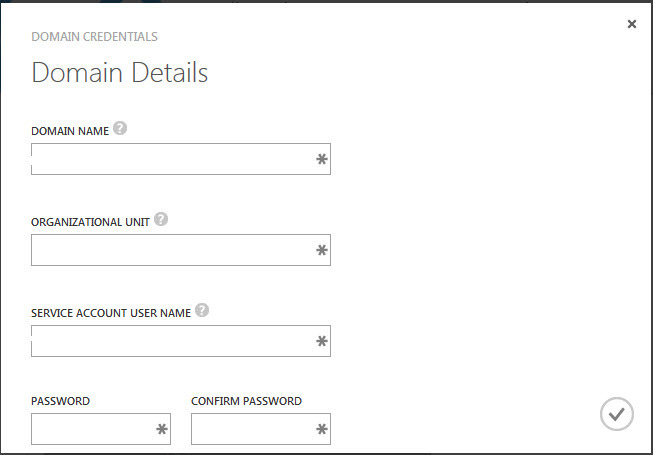 For accessing these applications it is required to use local identities by using Azure AD Sync. Prepare your Custom Image for the RemoteApp Deployment within Azure. 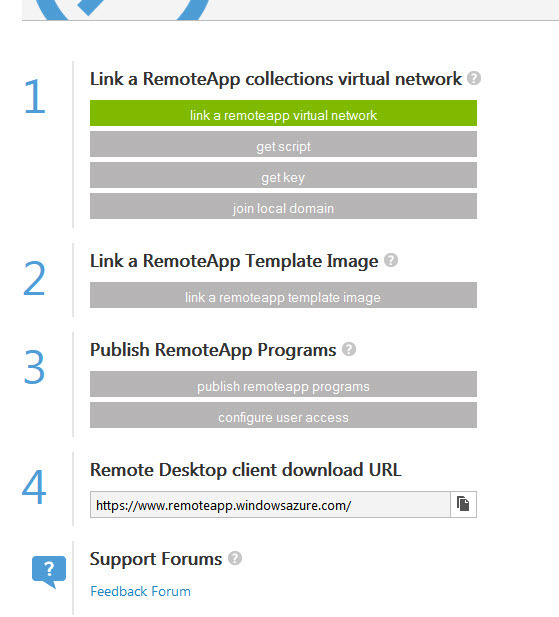 Link the RemoteApp collection to an existing VNET. Copy your Custom Image created within Azure to the RemoteApp template store. Publish Apps and Configure User Access. This all seems to be a lot of steps, so we better get starting! Virtual Dynamic Gateway or a VPN device. Setup Azure AD Sync with your on-premises or Azure environment. Set Azure AD as the Default Directory for your Azure Subscription. *Only required when you have your local Active Directory within Azure. We will prepare our Custom Image within Azure itself to save us some time when transferring the image to the RemoteApp template store. 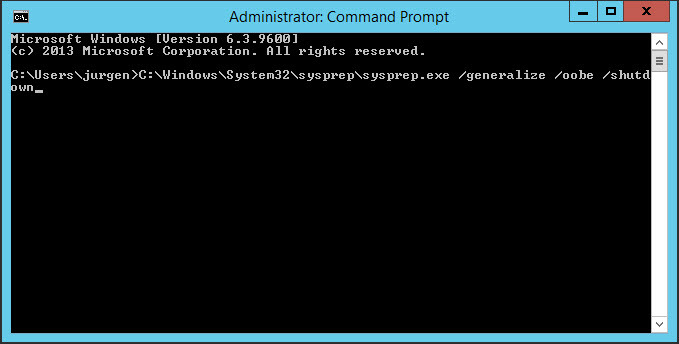 First of all create a Virtual Machine, in Azure, using the Windows 2012 R2 image. First of all add the Remote Desktop Session Host role and the Desktop Experience feature to the machine. After the installation is completed, reboot your machine. 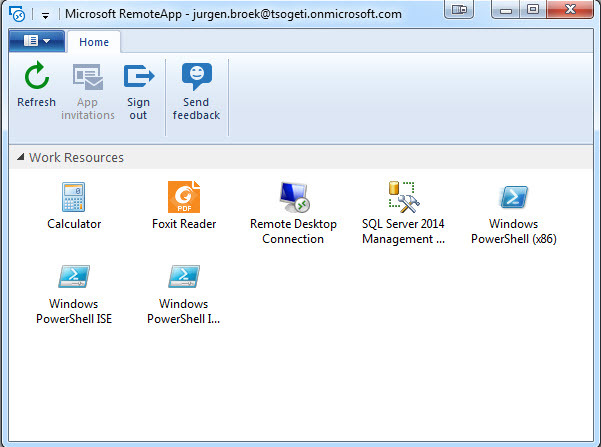 The next step is to install all your applications you want to publish by using RemoteApp on the Virtual Machine. 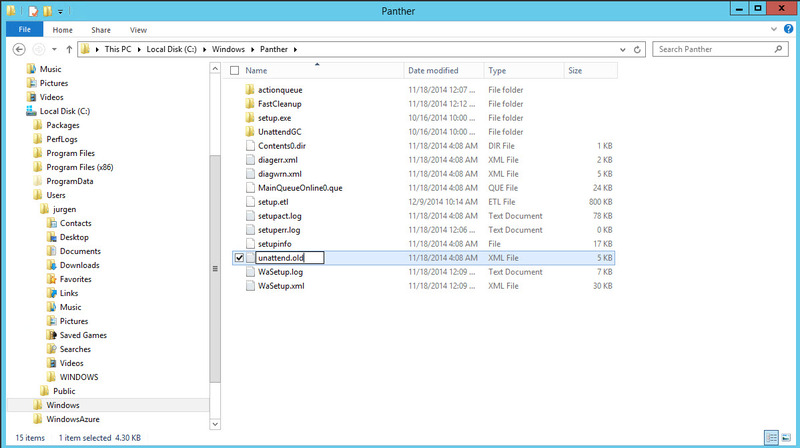 In this example I have installed SQL Management Studio 2014 and Foxit PDF reader. At this point you can also add management clients to the machine. A good example might be the SCCM agent. Finally you must make sure your Windows Updates are up to date and KB2984006 is installed (this includes KB2977219). Afterwards you can reboot your machine. 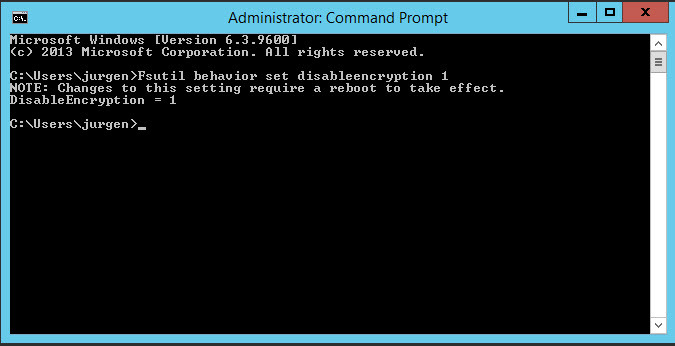 After the Sysprep process has completed, the Virtual Machine will shut down. In the mean while we will create the RemoteApp collection. 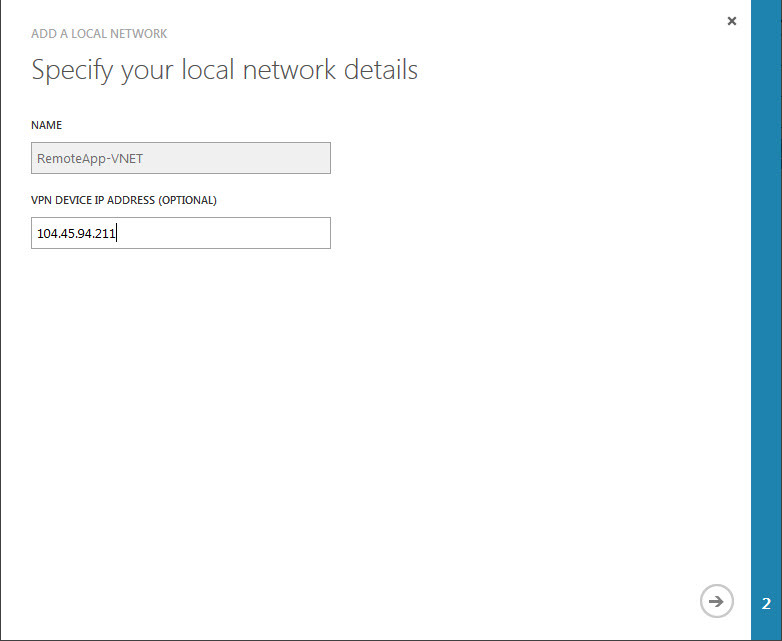 Select the RemoteApp -> Create With VPN -> give the collection a name and select the Basic plan. As mentioned before, for a hybrid deployment a VPN connection is required between the RemoteApp VNET and the on-premises network or Azure VNET. In this scenario a connection will be created between the 2 Virtual Neworks. Start the wizard by clicking on the link a remoteapp VNET button and select create a new RemoteApp VNET. 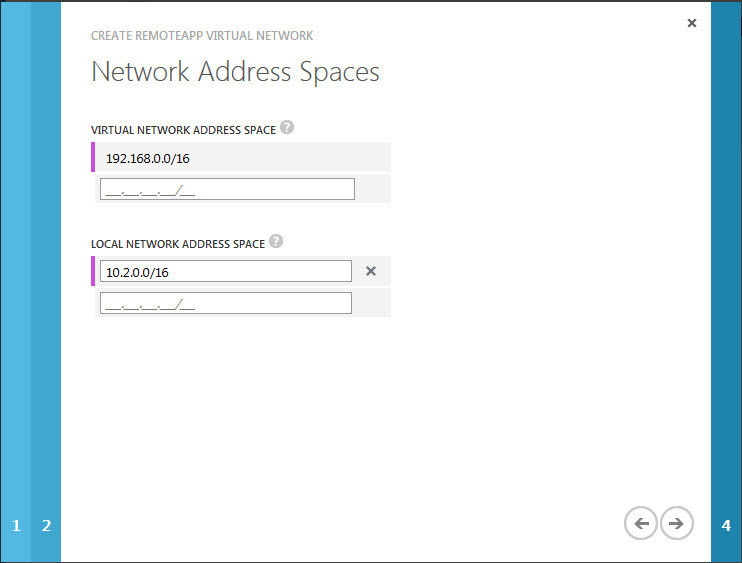 In the next step provide an Address Space for the RemoteApp VNET and define the local network, which is the address space of the Azure VNET you want to setup a connection with. Change the 1.1.1.1 address to the actual RemoteApp Gateway address noted in the previous step. VnetName: This is the name of the Azure VNET. SharedKey: This is the key you noted in an earlier step. $srcFilename = “RemoteApp-myApp-2014-09-14.vhd” #Name of the file. In the script you need to change the source parameters and the destination parameters. The values of the destination storage account can be retrieved from the RemoteApp wizard. You can check the status of the upload on the RemoteApp Collection overview page. When the status becomes active you can start publishing apps and assigning users. As you can see, I am able to publish my own application SQL Management Studio 2014. The final step is to add users to your RemoteApp collection. You can do this on the User Access page. All users in the list will be provided by the published apps in this collection. For Hybrid deployments it is a prerequisite to set you Azure AD as the default directory for the Azure subscription where your RemoteApp collection exists. The configuration of the RemoteApp collection is now completed! 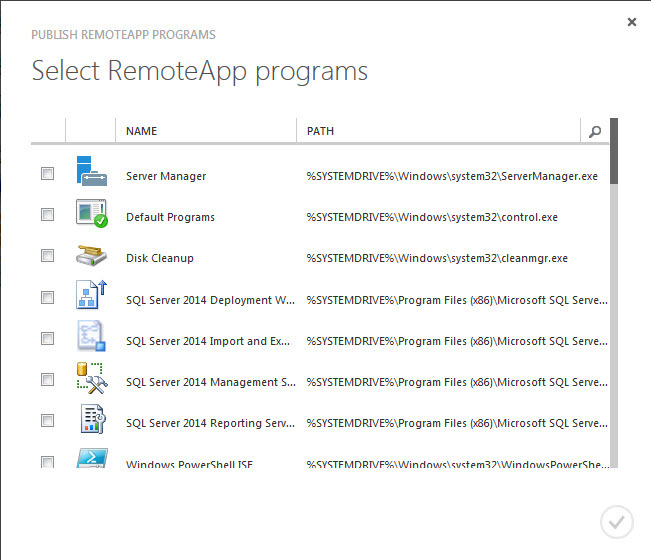 So now download the RemoteApp client and log in to check your published applications. Because we use a Hybrid Deployment you can setup connections between your RemoteApp client and your resources in your private network! For example databases by using SQL Management Studio. Deploying a RemoteApp Cloud Deployment would have been much faster but less complex. A Cloud Deployment does not require a Custom image or a VPN to the local network. On the other hand you can only use the standard images provided by Microsoft at the moment. At the end of this blog I just want mention it takes a way too much steps to deploy a RemoteApp Hybrid Deployment. 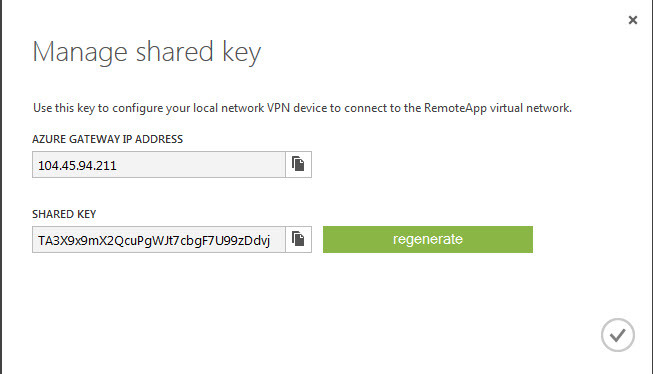 It would be more efficient if you can deploy RemoteApp in your own VNET and make use of the same storage accounts. This takes away the need of a VPN and transferring the image. So far I know, both these features are on the Microsoft calendar. So I cannot wait until they release the new stuff! Thanks! I will edit the post. Thanks for you feedback! I had to use a custom script because i created my image in Azure. If i wanted to use the generated upload script I had to download the vhd from Azure and upload back again using the script. In my opinion a waste of time. I will add your second point to the blog! Cloud VNET: a network entirely within Azure; no connection to on-premise network.. Hybrid VNET: a cloud network that is in effect an extension of an on-premise network. What you describe is how to connect a RemoteApp Collection (which in real terms is an RD Session Host server) to a Hybrid VNET. As it stands now, technically it should be “…with Hybrid VNET” and not just “…with VNET”. So what about connecting a RemoteApp Collection to a Cloud VNET? There doesn’t appear to be a way to do this. My backend SQL server is a VM in a Cloud VNET. I created and tested my RemoteApp image on an RD Sessions Host template that was also in the Cloud VNET, but then there’s no way to specify my RemoteApp server goes into the Cloud VNET. So how can my published LOB app connect to my SQL Server VM? So how can a Cloud Only solution work? Azure would make a lot more sense and be simpler to configure/manage if everything was based around VNETs instead of the dislocated collection of resources presented now. So you create a VNET (Cloud only or Hybrid) and then you add resources to the VNET. After all, that exactly how we do it in the real physical world. Then your Azure network looks and feels much more like a real network, which beneath the cloud marketing hype, is exactly what it is. Hi Oliver. This will apparently be addressed later this year. For now this is not possible. The only solution I came up with is to not use Azure Remote App but instead create an RDSH VM and publish as a RemoteApp from that using standard non-Azure RemoteApp facilities. Although for now not doing that and simply using a Remote Desktop to run the LOB app. Depending on users, that approach is probably more cost-effective given the 20 minimum on Azure Remote App. Then cost is the VM and one-off RD CALs instead of per-user monthly subscriptions. Great article. Is there any chance of getting the visio diagrams?